Synopsis: In the middle of their five year mission, the Enterprise is lured into a trap by a deadly alien threat by the villainous Krall, who threatens to tear the Enterprise, and indeed Starfleet apart. Review: It has been an incredible fifty years since Gene Roddenberry’s first television series carrying the title Star Trek burst onto small screens. Since then, thirteen feature films have made their way onto the big screen, and we have had plenty of spin-off TV shows. While not all of these have endured the kindest of reactions from Trekkies and critics alike, one thing cannot be disputed, the franchise has prospered through this half a century, making its mark on popular culture. When it came to the third installment of the rebooted franchise, with its golden anniversary on the horizon, fans were surely hoping that the franchise would strike gold once again, and well they are in luck, as its thirteenth feature film has done exactly that. With the man behind Star Trek and Into Darkness, a certain Mr JJ Abrams going off to a galaxy far far away, a number of directors were in the frame to take over the responsibility of the director’s chair, with producer Roberto Orci at one stage at the helm. However, that responsibility ultimately went to Justin Lin, of Fast and Furious fame. When the first trailer dropped many feared that this would be Fast and Furious but in space. However, credit where credit is due, as Lin has put together a very enjoyable and extremely well made movie that feels like a Star Trek movie should. With Scotty himself, Simon Pegg helping to write the script, they certainly aimed for a film that would please fans, given how Into Darkness was not very well received by some sections of the Trekkie community. The action here is once again of a very high quality with more than a few pulse racing sequences, the best of these scenes are by far on the hostile alien world that the Enterprise crew find themselves on. A few shaky cam scenes aside the action is put together very well and there are more than a few very funny moments packed into the movie’s run time. JJ Abrams may have returned in a producer capacity only, but full credit must go to him for putting together this amazing ensemble because once again, each and every one of them deliver great performances. 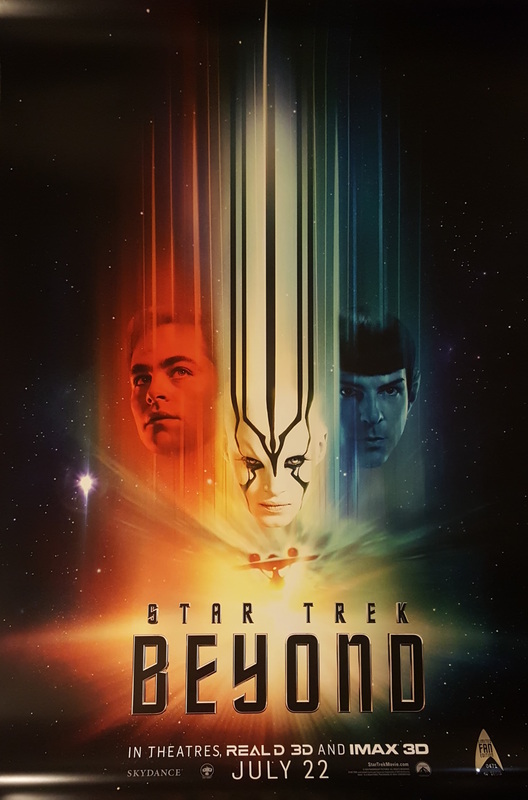 Yet again it is Chris Pine who really shines the brightest, with major kudos also going to Quinto and Karl Urban as Spock and Bones respectively. The latter duo in particular share a lot more screen time in this installment, and all the better for it as they make an effective duo! In terms of new arrivals, the standout by a considerable distance is Sofia Boutella’s Jaylah. Her work in Kingsman showed how much of a badass she could be and likewise here. The real let down here is the villain played by Idris Elba, an actor of immense talent, but his character could have been a little bit more fleshed out, and given a little bit more to do. He’s better than Nero from the 2009 reboot, but he’s by no means on the level of Cumberbatch as Khan, not even close. That being said, those who may have feared that this film would fall out of warp and crash and burn were proven to be very wrong indeed. The score by Michael Giacchino is once again of a very high quality. Thirteen maybe an unlucky number for some, but not for Star Trek, Star Trek is showing no signs of slowing down, and indeed, a fourth film is already in the works. Mr Roddenberry would undoubtedly be pleased to see the prosperity the franchise has enjoyed, and is continuing to boldly go where no franchise has gone before! The foundations that were laid by Abrams have been greatly added to by Lin, the cast remain excellent, as does the chemistry between the leads, with the quality action sequences also being maintained. At this rate, the franchise is at full warp speed and nothing is going to stop it! Thanks Tom! Hope you check it out! I’m so looking forward to this movie!